Review by AllTheBestFights.com: 2015-05-30, boring fight between Ryan Jimmo and Francimar Barroso: it gets one star. The black belt in karate Ryan Jimmo entered this fight with a professional mma record of 19-4-0 (53% finishing rate) and he is ranked as the No.26 light heavyweight in the world. He fought twice last year beating Sean O’Connell (=Jimmo vs O’Connell) but then he lost to Ovince St Preux (=Jimmo vs St Preux). His opponent, the black belt in Bjj Francimar Barroso, has an official record of 16-4-0 (87% finishing rate) and he entered as the No.78 in the same weight class. ‘Bodao’ Barroso debuted in the Ufc in 2013 winning over Ednaldo Oliveira but then he was defeated by Hans Stringer (via split decision). 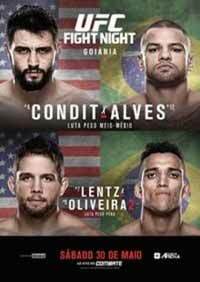 Jimmo vs Barroso is on the undercard of Carlos Condit vs Thiago Alves – UFC Fight Night 67. Watch the video and rate this fight!